Published Oct 1, 2012 by Addison-Wesley Professional. Part of the LiveLessons series. In Integer Types you learn about the representation, ranges, behavior, and uses of essential integer types in the C programming language including: unsigned integers, signed integers, character types, size_t, ptrdiff_t, intmax_t, and uintmax_t. In Integer Conversions you learn the rules governing integer conversions in the C programming language and how the C language converts integers to unsigned and signed types. Topics include; conversion rank, promotions, and the usual arithmetic conversions; conversions to unsigned types; and conversions to signed types. In Integer Operations you learn the behaviors of common integer operators, how to avoid undefined behaviors, and how to program safely and securely in the presence of implementation-defined behaviors. Topics include: assignment, addition and subtraction, multiplication and upcasting, division and remainder, and shifting. In Characters, Arrays, and Strings you learn about how strings are represented as null terminated character arrays in the C programming language. You learn about properties of arrays, as understanding their behavior is critical to understanding C language strings. You also learn about string literals and their use and idiosyncrasies in initializing arrays. You also learn about the underlying (and undocumented) philosophy underlying the use of the character types in the C language. In String Handling, you learn about the memory models available to C language programming as well as the advantages of bounds-checking interfaces over the standard C string handling functions defined in <string.h>. Topics include: caller allocates, caller frees; bounds-checking interfaces; callee allocates and caller frees (POSIX). In Optimization you learn what undefined behavior is, how the C standard identifies undefined behaviors in the language, and the latitude it grants to compilers in dealing with undefined behaviors. You also learn about common compiler optimizations and how these optimizations can produce unexpected behaviors. Topics include: undefined behaviors and the “as if” rule; constant folding; algebraic simplification and pointer arithmetic; hoisting of loop-invariant computations; dead-code removal; and aliasing. 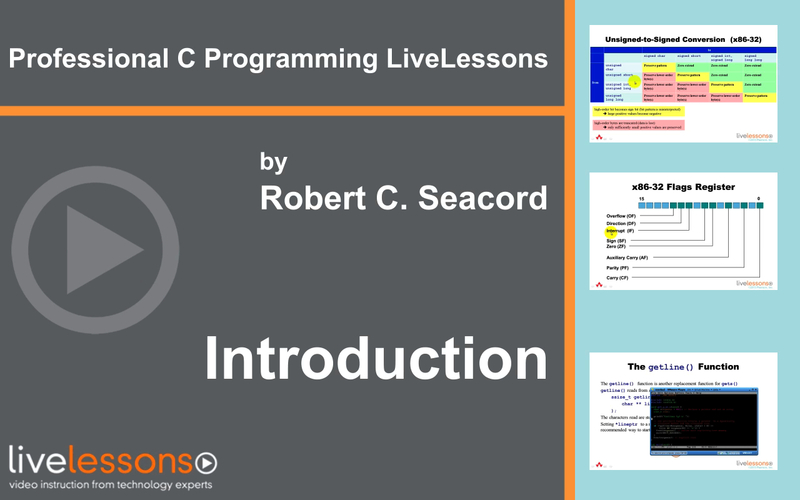 Professional C Programming LiveLessons, Part I: Writing Robust, Secure, and Reliable Code provides an in depth explanation of how to use common C language features to produce robust, secure, and reliable code. Author, instructor and programmer, Robert C. Seacord created this video for developers who have previous experience in C language programming. In six lessons, Professional C Programming, Part I shows developers how to perform common C language programming tasks correctly while avoiding programming errors that are not always detected or reported by the compiler. Robert C. Seacord leads the Secure Coding Initiative at CERT, located in Carnegie Mellon University’s Software Engineering Institute (SEI) in Pittsburgh, PA. Seacord is an adjunct professor in both the School of Computer Science and the Information Networking Institute at Carnegie Mellon University. He is also the author of The CERT C Secure Coding Standard and Secure Coding in C and C++ as well as other books on computer security, legacy system modernization, and component-based software engineering.